Winter is pasta time! When it's cold outside, we tend to crave warm, comforting, satisfying meals that will help push away those winter blues. What better way to give ourselves plenty of energy than through delicious and nutritious carbs? What can you serve at your dinner parties this winter that's ready in just 30 minutes, but is impressive enough to wow invited guests? This quick and easy Salmon Spaghetti Carbonara recipe is not only a breeze to prepare, but the flavor is simply divine, thanks to the decadent combination of cooked salmon fillets, bacon, egg yolks, heavy cream and Parmesan cheese. Studded with cooked green peas, for color and nutrition, this rich, smooth, salty and savory main dish recipe is sure to become a go-to in your repertoire. Every home chef needs a go-to recipe for Pasta Alfredo, which may just be the perfect way to eat pasta. It's a wonderful dish to enjoy for dinner in winter, with its rich and creamy consistency and cheesy flavor being especially satisfying. This indulgent recipe uses spaghetti, cream cheese, milk, eggs, Parmesan cheese and bacon to make the creamiest Pasta Alfredo ever. Ready in just 30 minutes, it's an ideal choice for weeknight dinners, or serving drop-in guests this winter. 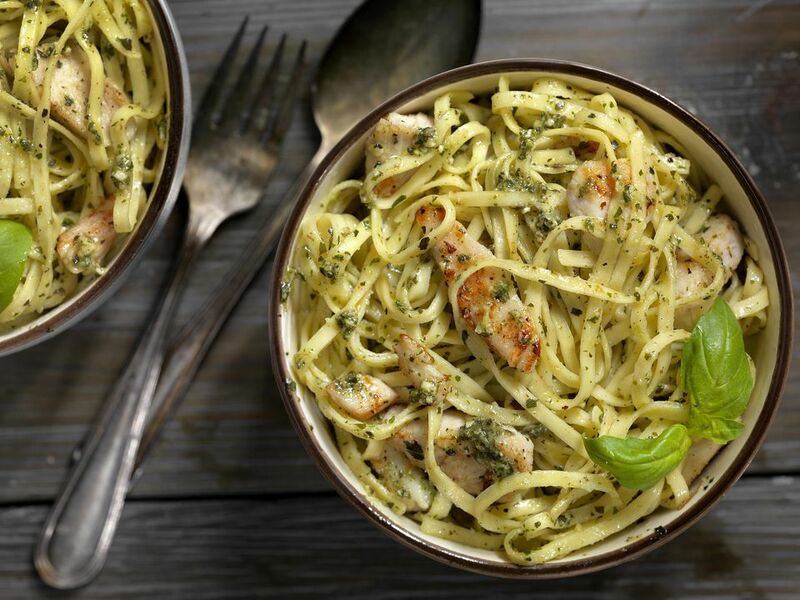 When you're having guests for dinner this winter, this Chicken and Pasta with Lemon Pesto recipe is the perfect main dish recipe for entertaining. Easy to prepare and elegant to serve, this yummy, creamy pasta has a lovely zing to it, thanks to the use of lemon juice and grated lemon zest, which bring out all the flavors. Store-bought pesto combines with cream to make the sauce for this rich-tasting chicken pasta, creating a flavor that's addictive and delicious. Creamy, rich pastas for vegan diets can be tough to find and prepare, but this recipe makes it possible. This vegan pasta dish has a yummy mushroom sauce that's super satisfying and warming on a cold winter night. It's so good that you'll want to start use the sauce for other dishes too, from cooked chicken (for our carnivorous friends) to rice dishes! This vegan mushroom pasta dish is impressive enough to serve guests because of its extra flavor, but it's crazy quick to prepare in just 30 minutes, so you'll have more time to mingle with your guests. Great for Sunday family dinners and school nights, too! Want to come home to a comforting, cheesy pasta dinner this winter, that practically makes itself? You're going to love this delicious, comforting version of macaroni and cheese that cooks in your crockpot — yes, even the pasta! Three kinds of cheese combine with the usual mac and cheese ingredients, plus lots of nutritious vegetables and store-bought Alfredo sauce, for a rich macaroni pasta dinner that's perfect to serve your family on a cold winter night. If you love spaghetti and meatballs, but don't like fussing in the kitchen - or doing dishes - you'll love this super efficient recipe that eliminates the need to cook your pasta separately in a big pot. This awesome Skillet Spaghetti recipe has you cooking the spaghetti pasta right in the sauce, for a one-dish dinner that checks all the boxes when it comes to a satisfying, meaty pasta dish that's ideal for winter family weeknights. Plus, with only five ingredients, including store-bought frozen meatballs and prepared sauce, you're out of the kitchen and eating in practically no time! This vegetarian spinach lasagna recipe is a delicious and satisfying way to enjoy pasta this winter. Whether you're following a vegetarian diet, doing Meatless Mondays, or just want to try something different, you'll be glad to have this go-to recipe for classic no-meat lasagna in your repertoire. Spinach lasagna is made with layers of smooth, creamy ricotta, Parmesan and mozzarella cheeses, lasagna noodles, frozen spinach, and your favorite marinara sauce. Serve it with garlic bread and a simple tossed salad for a filling, fabulous family meal. Take your tuna casserole to the next level with this scrumptious, comforting tuna pasta casserole recipe that makes a great everyday meal. Florentine style tuna pasta casserole is easy to make, with canned tuna, egg noodles, frozen chopped spinach, pimientos and Cheddar cheese. The perfect everyday meal this winter, it's great for warming up your family's tummies on on cold evenings. You can add nutrition to this dish by tossing in more of your favorite vegetables, as well. Vegetarian pasta e fagioli, or Italian pasta with beans, is a fabulous high-protein pasta recipe for vegetarians and vegans. Warming and comforting, this yummy and saucy winter pasta dish will give you plenty of energy on cold days, making it a great choice for lunch or dinner. In this easy recipe, small pasta and white beans are cooked in a delicious Italian-seasoned tomato sauce with plenty of garlic, fresh basil, oregano and lots of paprika for extra flavor. You can also top it with yummy Parmesan cheese, if you're not eating vegan. Chicken a la King is a beloved American recipe that's super comforting and tasty. This awesome chicken noodle casserole recipe is simple to prepare and is filled with the delectable flavors of chicken, pimientos, celery, breadcrumbs, and an easy, creamy sauce. It makes an excellent, warming family meal for any night of the week, or a great potluck dish for parties. Pizza lovers, we've got your new favorite winter recipe. Loaded Pizza Pasta Casserole is a hearty, easy main dish casserole that's perfect for satisfying your family's pizza cravings - no delivery service required! Made with cooked curly pasta, ground beef, mushrooms, bell peppers, Italian seasonings, mozzarella cheese, pizza sauce and your favorite pizza toppings, this filling and flavorful recipe will make a fabulous family meal everyday this winter. Here's an easy one-dish dinner with pasta that's vegetarian friendly, quick and easy, and perfect for serving to your family on busy weeknights. Broccoli and walnuts are a great flavor combination that combine nicely with small pasta shapes and Parmesan cheese, for a healthful and tasty dinner this winter. Want to enjoy the indulgent flavors of a traditional pasta carbonara, without the meat? This healthier, vegetarian take on the classic carbonara recipe combines nutty Brussels sprouts, rich eggs and flavorful Pecorino cheese make a quick, delicious and nutritious pasta sauce that's ready in the time it takes to boil water and cook pasta. A fabulous choice for winter entertaining, or easy weeknight dinners. But don't just take our word for it. Winter is the perfect time for hearty soups that are loaded with filling pasta. 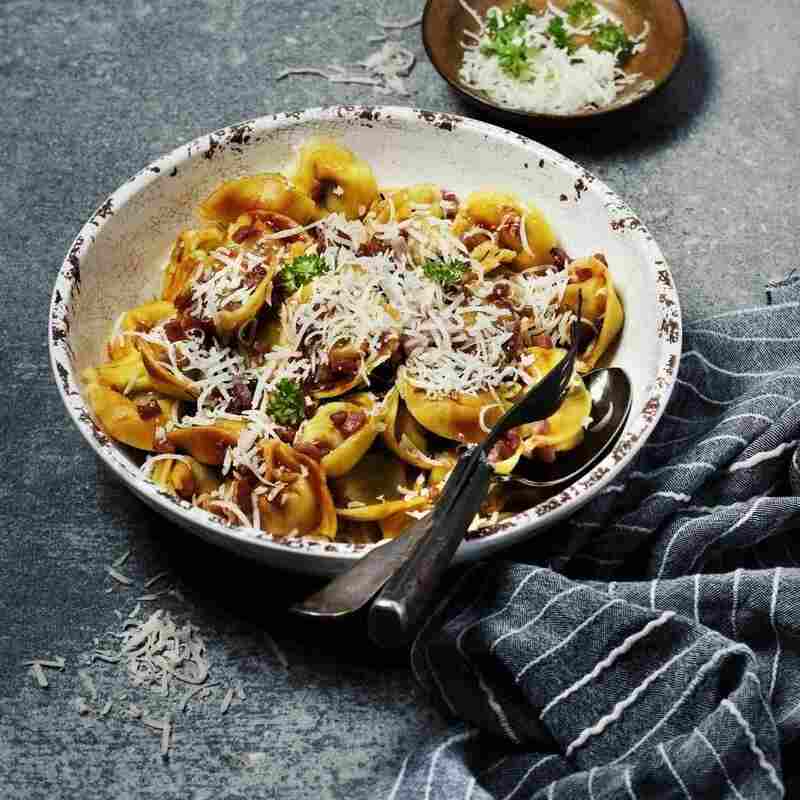 This sausage and tortellini soup is jam-packed with vegetables and great flavor, for a satisfying dish that's great for warming your spirits on cold winter days. Add a salad and crusty bread to make it a fabulous family meal! Love lasagna, but crave something a bit quicker? This delicious baked ziti casserole is similar to the classic layered lasagna, but it's not as time-consuming. The ziti is cooked and tossed with ricotta and meat sauces, then layered with more tomato sauce and cheese, for a hearty dinner recipe that's ideal for enjoying on a cold winter day. Garlic bread makes the perfect accompaniment to this fantastic family meal. We're serious - this is the ultimate meat lasagna recipe! With twice the meat and cheese filling as most lasagna recipes, this meat lasagna really is the best. What can we say, you have to try it to appreciate how seriously satisfying and tasty this pasta main dish is. It's definitely worth the effort to make the homemade sauce in this recipe, which is fabulous for feeding a big crowd. Ham, cheeses and artichokes add great flavor to this hearty chicken and pasta casserole. In addition to that, pasta, chicken and vegetables are cooked with Cajun seasonings and two types of cheeses for a saucy, delicious, one-dish chicken pasta casserole dinner. Use bowties, rotini or macaroni in this tasty dinner and get ready to see your family smile. Browned Italian sausage and tomatoes make a delicious homemade sauce in this yummy bow tie pasta recipe. Your family will love the classic Italian flavors in this easy pasta meal that's wonderful for dinner this winter. Just serve with crusty French or garlic bread and a tossed green salad and you'll be set. Is there anything more comforting than a cheesy, hot, vegetarian baked pasta casserole? And the best part of all, is that you don't have to add meat to the mix to create an oven baked pasta casserole dish that is nourishing, satisfying and enjoyable for the whole family. The recipe uses basil, Parmesan cheese, spinach, ricotta cheese, tomatoes and spinach to create a cheesy casserole that is healthy enough that adults will approve, yet cheesy enough that kids will love it, too. It's the perfect vegetarian family dinner dish this winter.